St Wulfram's church has a very long history of welcoming visitors. In medieval times pilgrims came to pray at the shrine which held a relic of St Wulfram. This was located at different times in the Crypt Chapel and in an upper floor of the North Porch. 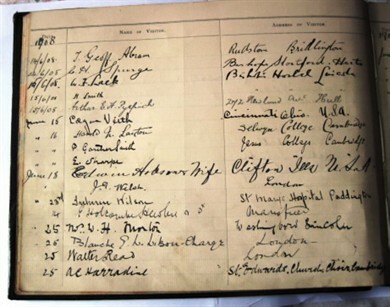 We know that at least 519 people visited St Wulfram's church in 1908 from their signatures in a Visitors' Book. The vast majority were from England, Scotland or Wales, but there were four visitors from the United States of America, two from Australia, and one each from New Zealand, Natal, India, Canada and Ireland. Below is a page from the 1908 Visitors' Book. One hundred years later, in 2008, we welcomed around 13,000 visitors. 1,200 of these signed the Visitors' Book. Nowadays there are far more visitors from outside the UK. People from 37 other countries signed the Visitors' Book. The greatest number were from the United States (77), followed by Australia (31), Germany (30), Canada (19), Poland (18) and France (12). We also welcomed a smaller number of visitors from Hungary, Japan, Russia, Lithuania, Bulgaria, Mexico, Malaysia, Czech Republic, Latvia, New Zealand, Spain, Slovakia, Romania, India, Malta, Belgium, Brazil, Finland, Austria, Croatia, Italy, Netherlands, Sweden, Norway, China, Ireland, Portugal, South Africa, Channel Islands, Columbia and Denmark. Although it would be interesting to show a page from a recent Visitors' Book as it now includes comments, we shall not do so, as we wish to protect the identity of our visitors. We hope that you will join in a very long tradition of visiting St Wulfram's church and we look forward to welcoming you. Please go to www.stwulframs.org.uk to see opening times for the church, coffee shop and the Trigge Library.